There’s a few reasons why I’m wearing it. Firstly, it’s because it’s comfortable: it keeps me warm in Addis’ chilly weather, but it’s not as bulky or confining as a jacket or sweater. Secondly, it’s useful: it has deep pockets that hold my glasses case, phone, duct tape, tablet, stapler, loose change, scissors, hard drive… you get the idea. But more importantly, it serves as a reminder to me of some of the ideals that I strive to live and work by. Let me explain. In his book, Principle-Centered Leadership, Stephen Covey talks about the idea of “yoking up” for your work. He says that when you get dressed to go to work, you should envision yourself as being yoked up to the people you work with and work for – visualize yourself getting strapped in to a harness that you pull with others to accomplish a shared task. It’s a mindset that the work you do is not for your own sake, but as a service to others. Which one shall I wear today? 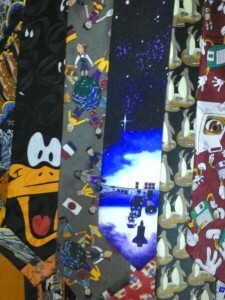 I’ve worn neckties nearly every day of school almost since the first day I started teaching. Initially, it was an effort by a young teacher to separate himself visually from the high school students who were nearly as old (and some bigger!). But as I progressed, it became a kind of signature style, with a significance that few really perceive but which I do think about periodically. By wearing a necktie to work, I adopt the social convention of professional work. To me, teaching is a highly professional work, one that should be done with great effort and purpose. I see myself and my colleagues as serious workers in a vitally important field, and I wish that western society (OK, mostly American society) placed greater value on our/their efforts. Teachers are incredibly important people and the work they do is incredibly important. Nearly all teachers take extraordinary effort to help young people learn, grow and succeed. I wear a necktie to signify the professionalism of my occupation. When I put it on, I do it as a visual cue that teachers’ work matters. I see myself as “yoking up” to the profession of education. Badges? We don’t need no steenkin’ badges! 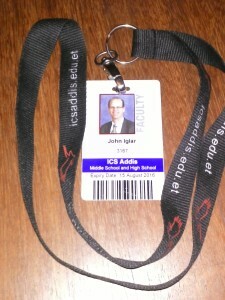 Our school has required us to wear an ID badge for years. It’s a security requirement and an expectation for all employees. I have been known to critique the process: high school students look like adults but aren’t required to wear them, parents aren’t required to display them all the time, enforcement is idiosyncratic, I and my colleagues are known to all our students, etc. Yet, I put on the badge. For me, it’s a yoking up to my school. When I put it on, I think about the commitment I make to my school’s mission and ideals. I know that our school’s success depends on all of its employees working together in common purpose and in support of our philosophy, our vision, our mission, our school goals. I’ve intentionally joined our school, as have others, and by wearing the badge I signify that decision, my commitment, and our commonality. 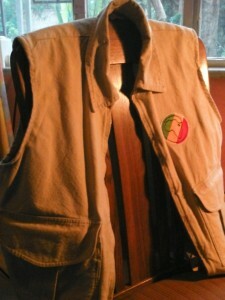 The safari vests were commissioned for our recently held conference, Learning 2.014. 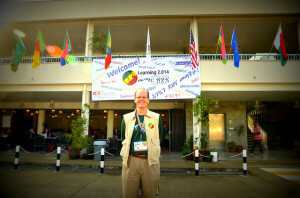 ICS hosted the first Learning2 conference in Africa, joining a seven-year tradition of Learning2 conferences held in Asia. This conference is different than others. If you read about the history and the founding principles of the Learning2 conference, you get an idea of how it is different. Its intention is to socialize the participants, getting them to interact throughout. It aims to get people to connect with each other, and with others. It asks participants to “be a connector” – not just to connect, but to enable connections. Learning2 conferences aim to put the participants first: replacing flashy big-name keynote presenters with actual teachers, and encouraging participants to take the lead in unconferences and workshops. Finally, the conference aims to be different: renewing itself every year, adapting after each conference is held …and while each conference is held, making modifications as the conference unfolds. 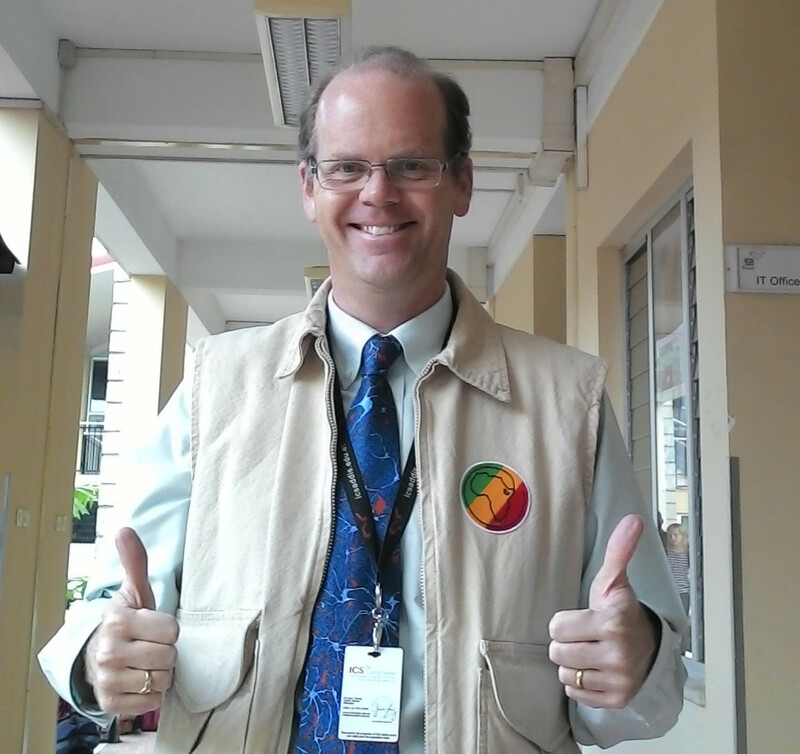 When I put on the safari vest, I remember these ideals and yoke up to the community of educators – both in the Learning2 conference circle and like-minded educators outside of it – who are committed to growing and changing and making a difference. I remember how excited our teachers and our visitors were to be together, learning and sharing on our campus. I think about the importance of sharing, of being social, of connecting and facilitating connections. It helps me to make daily efforts to be different, to help other educators, to be part of a dynamic world of education. And I think about the conference’s theme: Learning Safari. I want my work to be a journey of adventure, exploring new areas and seeing and trying new things. I want that for me. I want that for my colleagues. I want that for my students. Wearing my safari vest puts me in that mindset. That’s why I wear the vest. I appreciate how professional you are, John, and part of that is the way you “yoke up” each day. And, I also appreciate how some days you let me wear the better tie! Hats off for the sentence below and the blog as a whole!!! I am part of your yoking-up circle who dream and work to make a difference in education. Thank you.